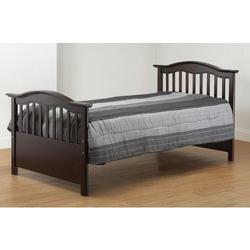 The Orbelle Solid Wood Twin Bed is a Beautifully Detailed Curved Spindle Head Board and Foot Board. 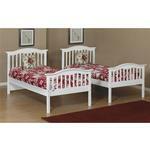 This Magnificent Hand Crafted Mission-Style Twin Bed will add Beauty and Charm to any Childs Room. 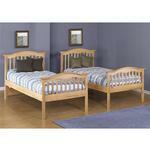 The Orbelle Twin Bed is constructed of Solid Beech Wood. The Bedding and Mattress are Not Included. All Tools are Provided for Easy Assembly. Inner Dimensions: 39 1/2" H x 45 1/4" W X 78" L Headboard Alone 39 1/2" H x 45 1/4" W. Footboard Alone 32 1/2" H x 45" 1/4" W. Inches from the Floor to the Bed 13 1/2"